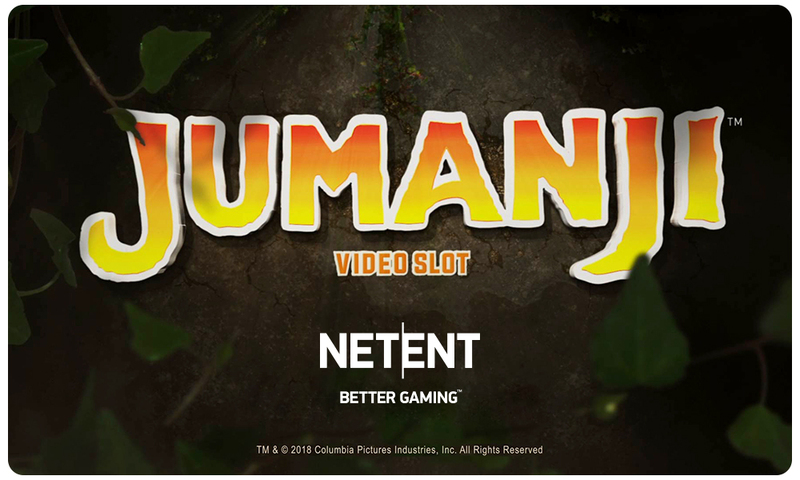 NetEnt is known for bringing its unique design approach to branded casino games, and the Jumanji slot is the latest in that proud tradition. The company previewed the slot at a big gaming conference in London earlier this year, and now you can play it. This Jumanji slot review takes you through everything you need to know before you hit the reels. The game is based on the original 1995 Robin Williams film. However, NetEnt timed it perfectly to tie in with the release of Jumanji: Welcome to the Jungle. The new movie features Dwayne ‘The Rock’ Johnson, Kevin Hart and Jack Black and brings the franchise up to date. It says a lot about the appeal of the original that it should spawn both a slots game and a sequel. When Jumanji comes out on Thursday 21st June, you will be able to play it at any of your favourite NetEnt casinos. These include Rizk Casino and Casimba. Click the logos before for our expert reviews of those sites, or hit the link to visit now. The slot is a five-reel, 36 payline adventure, with a minimum spin price of 10p. There are four basic features that you can access from regular play, with a further five different bonus rounds when you venture into the board game. The visuals are stunning, featuring many of the animals from the film as symbols. You also have all manner of creepy crawlies making their way around the reels throughout. The Jumanji slot doesn’t look like your average slot though, with the reels coming in differing sizes so they look like a diamond on the screen. You’ll have no issues playing this game on your favoured device. As standard, NetEnt ensures their games look perfect on desktop, mobile and tablet, with typical super smooth gameplay. 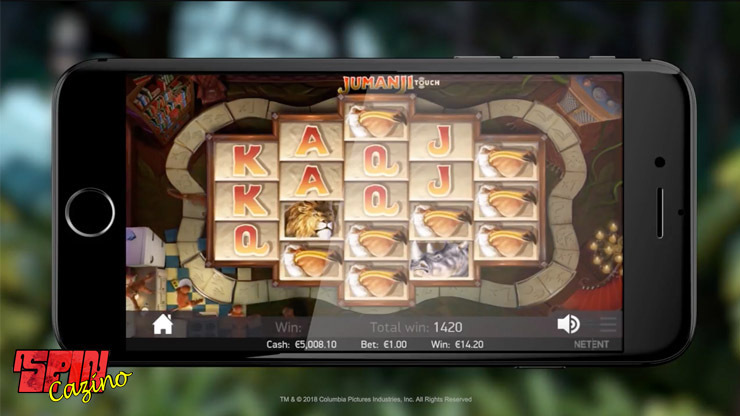 There are plenty of features on the Jumanji online slot to keep you entertained. If you are a fan of the manic and chaotic film, where there was so much going on, this game fits that vibe perfectly. Woah! Watch out for the rhinos trampling across your reels. Whilst this may sound like a scary prospect, they bring a bunch of Wilds with them, increasing your chances of winning. This features adds between four and nine new Wilds. Those silly simians ensure you win something by shuffling all of your reels. The outcome is a guaranteed winning line. Whilst the reels spin, the jungle monsoon breaks out. This can send one or two of your reels Wild, making it easier to complete winning lines. This brings you some sweet respins. The great thing is that the winning combinations stay in place, waiting to be added to. As you add to your lucky combos, your bankroll shoots up and the feature continues until there are no new wins. This brings five free spins on the Wild Stampede game, with the extra Wilds that brings. You gain six free spins, each followed by the monkeys shuffling the reels to guarantee a win. Pick up seven free spins, with either one or two Wild reels blown onto the board by the monsoon. This is a big one. You have ten free spins, each with respins until there are no new winning combos. Symbols that do form winning lines stay put and the vines hold your Wilds in place too! The Mystery Feature is another big one to pick up. It multiplies your prizes, brings in free spins or adds extra dice to the board game. Whatever happens, you are sure to do well from landing this bonus on the Jumanji slot. Jumanji Slot Review – Should I Play Jumanji? Jumanji is another triumph from NetEnt, who rarely put a foot wrong. This looks great, sounds fantastic and is bursting with features. It’s the perfect combination of nostalgia for the 90s film and current appeal for fans of the new movie. It features a jackpot of 504 times your stake, which is well worth a shot at. If this Jumanji slot review has tempted you, visit your favourite NetEnt venue as soon as the firm releases it to UK casino sites on Thursday 21st June.